After a teaching career, April decided to pursue her law degree at the Birmingham School of Law. She graduated with honors and was admitted to the Bar in 2013. April immediately began volunteering with the Birmingham Volunteer Lawyer Program at the Domestic Relations help desk. She is currently a member of the Birmingham Bar and the Shelby County Bar. April is active in her community, having previously taught legal classes at Brown Mackie College and a current member of the Fraternal Order of Eagles and Alpha Omicron Pi alumnae. 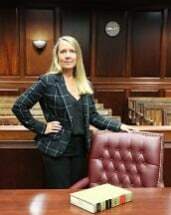 She was given the Pro Bono Service Certificate of Appreciation in 2014 and 2015 and contributed to the Merrell Law Firm being awarded the 2016 Small Firm Pro Bono Award. April's practice is mainly family law, where she focuses on the client and their needs. She strives to develop a strong relationship with her clients, be an aggressive advocate, and provide healthy paths for resolution.